I was browsing heels, as always, on Luisviaroma.com the other day and when I saw these pumps HERE by Max Kibardin I instantly stopped. 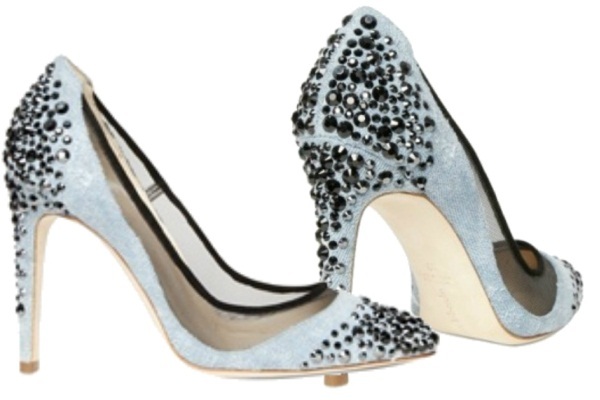 Denim and swarovski crystals combined together to make a pump! Genius! I especially love the lace detail and velvet piping. Sadly these shoes are so out of my price range, but it's still fun to dream. I had never heard of Max Kibardin before so I went and visited his page and fell in love. Have you seen or heard of him before? What are your thoughts? To be honest I've never heard of this brand either, I guess it's not just the three of us. So I was very much surprised when I followed the link to the store and found out how much it costs! However, I think it looks like the n-th version of Louboutin's Pigalle, but that's not a bad thing.